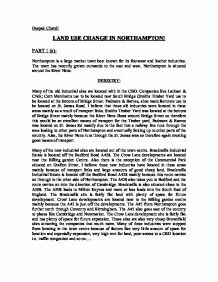 Deepak Chandi LAND USE CHANGE IN NORTHAMPTON! 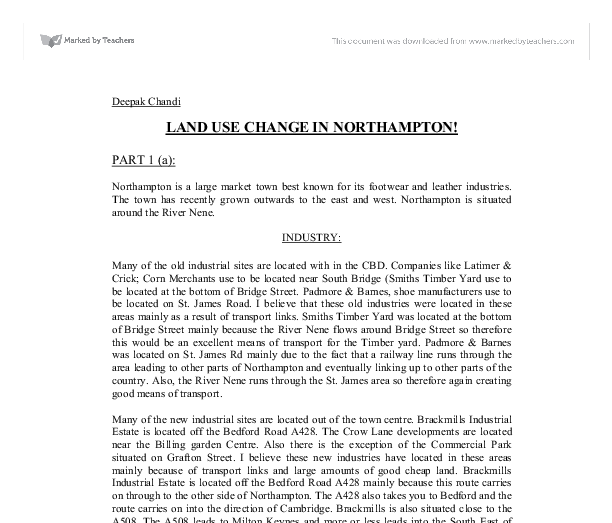 PART 1 (a): Northampton is a large market town best known for its footwear and leather industries. The town has recently grown outwards to the east and west. Northampton is situated around the River Nene. INDUSTRY: Many of the old industrial sites are located with in the CBD. Companies like Latimer & Crick; Corn Merchants use to be located near South Bridge (Smiths Timber Yard use to be located at the bottom of Bridge Street. Padmore & Barnes, shoe manufacturers use to be located on St. James Road. I believe that these old industries were located in these areas mainly as a result of transport links. Smiths Timber Yard was located at the bottom of Bridge Street mainly because the River Nene flows around Bridge Street so therefore this would be an excellent means of transport for the Timber yard. Padmore & Barnes was located on St. James Rd mainly due to the fact that a railway line runs through the area leading to other parts of Northampton and eventually linking up to other parts of the country. Also, the River Nene runs through the St. James area so therefore again creating good means of transport. Many of the new industrial sites are located out of the town centre. Brackmills Industrial Estate is located off the Bedford Road A428. The Crow Lane developments are located near the Billing garden Centre. Also there is the exception of the Commercial Park situated on Grafton Street. I believe these new industries have located in these areas mainly because of transport links and large amounts of good cheap land. Brackmills Industrial Estate is located off the Bedford Road A428 mainly because this route carries on through to the other side of Northampton. The A428 also takes you to Bedford and the route carries on into the direction of Cambridge. Brackmills is also situated close to the A508. ...read more. Now day's shopping centres have become a family friendly zone. They offer a very clean and friendly environment for people in general and especially families with their small child care facilities for the day, which offer small children with a fun day out in safety for a small minimal charge to parents. This allows mothers to be away from the constant nagging of their children and enjoy themselves shopping. Another attraction to the leisure attached to shopping is the fact that there are numerous small cafes, benches and quiet seating areas in the shopping centres, which allow people to sit down and have a coffee or something to eat or even just relax for a while. LittleWoods is a prime example of what I have just mentioned. They provide good hot meals at a fractional price, which allows people to sit down, take a break from shopping and relax. With these sorts of incentives who wouldn't see shopping as leisure! Another factor is that shops these days are located so conveniently and in just the right place that when people go into town they are constantly hounded by the convenience of every store. The town centre is also much more pedestrianised than it was before. The old Cannon cinema in the town centre has moved away and there is a new one in Sixfields. The old shopping parts of the town have moved to areas such as Riverside and Sixfields. These areas are next to dual carriageways so transport is not a problem especially when nearly every family has a car or two. 50 years ago cars weren't too common so areas such as these remote places would have not been chosen for such important parts of the town. Many of the small shops like Newsagents have been driven out of the CBD mainly because of competition. There are very few units in the CBD, which are vacant with a low rent. Many of the units have high rent and are not very spacious. ...read more. This is why Morrissons was raised by 1 metre from ground level, which saved it from the 1998 floods. The site is bound to have a substantial impact on the surrounding area. Access will be a big problem seeing as the roundabout is likely to be the entrance and exit of Morrisons. This is a huge problem at peak times when masses of cars are traveling past the site. This will lead to traffic congestion, which is far too much traffic for such a small roundabout to handle. One way the congestion problem could be solved would be to develop a One-Way system, possibly having the exit to come out onto the Cattle Market Road. This would divert traffic away from the roundabout therefore meaning that the only congestion would be people getting into the site via the roundabout. The Archaeology of the site will definitely have an impact on the area. Despite how ever much the building is made to look like its surroundings the fact that the site is a new development will affect the general look of the entire area. Flood defence is another impact on the area simply because, the land is flat and is vulnerable to flooding from the River Nene. Sewer and drainage is one of the most important issues of the impact on the area. Drainage must be good in case of heavy rainfall, which may lead to flooding, also just as importantly sewage disposal must be good for the general health and appearance of the site. Having considered all the 'pros' and 'cons' it was decided to go ahead with the development of the old cattle market site into Morrisons simply because the advantages of developing the site far out weighed the disadvantages of developing the site. Also at the time when people were given the chance to appeal against the development no one did so, so the application went through with no problem what so ever. ...read more. An excellent review of a variety of urban issues, covering 2 specific cases - the superpub and Morrisons. The student shows very detailed knowledge of the area, with specific named examples, distances and companies. They would benefit from an introductory paragraph explaining what the report will do (aims) and this would help understand the structure. There are just a couple of examples of information that may not be relevant to the report overall, e.g. the stages and set up of the Council/planning permission. Although this is detailed info, it does not directly matter to the main issues of the report. There is some comparison and discussion of impacts and factors, showing some evaluation skills. This could be further evidenced if done in the final paragraph too. Now I am going to talk about Turks migration to Germany after the second world war. Also, due to the inadequate sewage disposal systems of tourist accommodations the ocean around the island has been contaminated and it not only destroys the marine ecosystem but also makes it harder for the locals to get clean water and even seafood because of bioaccumulation effect (see Appendix B). The images in the brochures show idyllic scenes of open plains, with little traffic and tourists looking at animals relaxing in their natural habitats (Fig 5), when in reality it is completely different (Fig 6), shows large numbers of safari vehicles flocking to the area where one of the "Big Five", a lion, has been sighted. Hot air balloon rides are very popular in the game reserves, but the noise of the burners can scare the animals. The boundary of the drainage basin is called the watershed and is usually a ridge of high land. ?Figure 4 The drainage basin of a river Loughton Brook begins in the high land and joins the River Roding at a confluence in the middle course. These workers ?tap,? or collect, the sap from rubber trees that grow in the rainforest. The sap is then dried to make rubber products such as erasers or tires for cars and bikes. Rubber Tapping Does Not Hurt the Forest.